Mangaluru, March 02, 2015: State Minister for Labour PT Parameshwar has informed that four ITIs have been sanctioned to the district by the government. 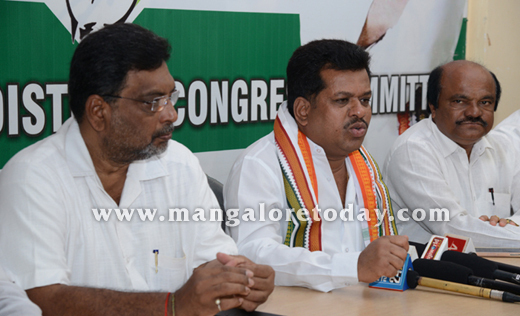 Speaking to reporters at the District Congress Office here on March 2, Monday, Parameshwar said a proposal for sanction of Rs 1100 crore in the upcoming budget of the state government has been placed by the Labour Department in order to ensure job opportunities for graduates and post graduates and also to those who have cut short their education. He further informed that as many as five lakh construction workers have been identified and registered to possess smart cards. There is also plan to bring BPL families under Rashtriya Swasthya Bhima Yojana, Parameshwar informed. Former mayor Shashidhar Hegde, Sadashiva Ullal, Nazeer Bajal, TK Sudhir and other party leaders were present at the press meet.